And since the influx starting in 2014 of child migrants fleeing gang violence in Central America, the CIR prerequisite of “securing the border” before even a highly limited means of legalization has meant warehousing children in detention centers — starting under Obama’s watch — where they are physically abused and emotionally terrorized. On the political front, as mainstream immigrants rights groups and pro-immigrant unions have gotten on the CIR bandwagon and explicitly argued for it as the best possible compromise, the effect has been to lower expectations, demobilize resistance and weaken bonds of solidarity among immigrant communities across the country. THE STRUCTURAL and ideological roots of comprehensive immigration reform go back to the Reagan-era Immigration Reform and Control Act (IRCA) of 1986, which traded relief for 2.5 million people in exchange for the further criminalization of the remaining undocumented population through enhanced border and workplace enforcement. As Justin Akers Chacón documents in his book No One is Illegal, this criminalization led to a drop in pay for undocumented workers, who had previously made similar wages to their U.S.-born counterparts. IRCA thus became a major milestone in the creation of a pool of hyper-exploited undocumented labor. Since then, the government has only gained more tools to control and repress immigrants. In the 1990s Bill Clinton combined vague promises of relief to the undocumented population with harsh anti-immigrant legislation that increased border security, expanded the grounds for deporting immigrants with legal status and cut noncitizens off of many federal benefits. The actual term “comprehensive immigration reform” and its general framework were introduced by then-President George W. Bush in 2001 in a deal with Mexican President Vicente Fox that was announced just five days before September 11. After 9/11, Democrats and Republicans alike shifted in a militaristic and xenophobic direction. To begin with, agencies charged with border security require new technology, new facilities and more people to stop, process and deport illegal immigrants… To keep from having to go through this difficult process again in the future, we must also replace the flow of undocumented immigrants coming to work here with a new flow of guest workers. Last month, Trump mischievously tweeted a 2005 clip of a similar Obama speech about undocumented immigrants “disrespecting the law.” Trump’s trolling was ugly as always, but in this case, he inadvertently showed how bipartisan support for CIR’s anti-migrant logic has paved the way for the more blatant post-CIR xenophobia of the hard right. THE OTHER factor that shaped CIR and provided a counterweight to the anti-terror hysteria was the explosion of immigrant protest in 2006, when hundreds of thousands of immigrant workers of all nationalities and statuses responded to draconian federal legislation by marching in the streets to display their powers as workers and demand their rights. The “mega-marches” from March to May 2006 demonstrated the awesome power of immigrant labor, culminating in the May 1 Day Without an Immigrant — the largest single day job action this country has seen, which shut down workplaces from the port of Long Beach to dozens of meatpacking plants. These immigrant workers weren’t pleading for relief or trying to prove what good citizens they could be in order to be granted some limited protection. Instead, they were demonstrating in practice the decisive role their labor plays and demanding their right to live and work freely in this country. Unfortunately, this power was demobilized as suddenly as it had first appeared. Why? Government repression undoubtedly played a large role, aided by the legal and enforcement tools gained through two decades of bipartisan “reforms.” The Bush administration carried out a series of large workplace raids, followed by a raft of deportations, specifically intended to strike terror in immigrant communities around the country. But another factor was that immigrant workers were demobilized by a political strategy to line up the movement behind the fatally flawed framework of CIR — and, relatedly, electing Barack Obama as president. The tragedy of CIR is that after May 2016, the immense power of mass protests and strikes was steered into something different: a defanged electoral movement — this for a movement made up in part of people who can’t vote — aiming to repackage itself as something nonthreatening to the powers that be. IN REFORM Without Justice: Latino Migrant Politics and the Homeland Security State, Alfonso Gonzalez documents the creation of Reform Immigration for America (RIFA), which brought together a dizzying wide array of “stakeholders” — local and national immigrants rights groups, labor unions, clergy, business coalitions and Democratic Party think tanks — to coordinate a national strategy around CIR. Gonzalez notes the central role played by the Center for American Progress (CAP) — led by Clinton operative John Podesta — the Center for Community Change and the National Council of La Raza. In 2008, CAP and the Coalition for Comprehensive Immigration Reform circulated a confidential memo called “Winning the Immigration Debate,” which insisted, based on an opinion poll, that Americans support immigration more when there are punitive measures for undocumented immigrants seeking relief. It specifically argued that immigration reform proponents should use the term “illegal” instead of “undocumented” and shift from depicting undocumented immigrants as victims to depicting them as lawbreakers who must be punished before regularizing their status. From 2006 on, immigrants rights groups were encouraged to throw their support behind different pieces of legislation that not only included enhanced enforcement, but also an extremely narrow and putative “path to citizenship” for some immigrants that could decades to complete, imposed prohibitive fines and back taxes, and had strict employment requirements. These CIR laws would have likely made legalization inaccessible for the majority of undocumented immigrants — while further increasing the very tools used by both the government and employers to control immigrant workers. In March 2010, RIFA organized the March for America to push for CIR. Some 250,000 immigrant workers and supporters rallied in Washington D.C. I got on a bus with my union, Service Employees International Union, to participate in the march. But missing from the messaging were the details: What kind of immigration reform were we fighting for? While certain groups and forces that challenged and even opposed the CIR framework were there, RIFA set a lead that didn’t question the basic framework. Over the next few years, the content of CIR legislation moved further to the right, with more enforcement and ever-narrower relief components. The blatantly pro-corporate CIR bill of 2013 — inspiringly titled the Border Security, Economic Opportunity and Immigration Modernization Act — led more militant sections of the movement to question the framework of CIR. But the biggest unions and immigrant rights organizations continue to take their marching orders from the Democratic Party, which has led us into a blind alley. THE TIME is long past to jettison the framework of “comprehensive immigration reform” once and for all. For one thing, Trump’s war on immigrants of all statuses shows that we need a united fight against xenophobia that rejects the racist portrayal of undocumented people as lawbreakers deserving of punishment. CIR has never offered anything but increased repression for those who haven’t yet migrated to this country, and now it’s clear that the racist demonizing and repression of asylum seekers is intimately connected to the attack on immigrants of all statuses who are already here. It’s time for pro-immigrant groups of all types and sizes to ditch “comprehensive immigration reform” and adopt a new framework which understands that the fate of documented immigrants in this country cannot be separated from the fate of new migrants seeking asylum — and which demands, first and foremost, the emptying of the detention facilities, the demilitarization of the border and rights for all people to live and work freely. Just as you cannot separate migrants of different statuses into neatly divided categories, you cannot separate “immigrants” in this country from the rest of the working class that is being attacked by the same government jailing Central American children and carrying out deportations. The migrants have been called an invasion of terrorists and criminals. But the terror comes from the U.S. halls of power and privilege, from the same people who oppose unions, universal health care, and raising the minimum wage. Those in power want us to blame immigrants for our economic struggles. But we know that the rich and corporations, not immigrants, have cut our wages and shipped our jobs abroad. Instead of deporting immigrants, we need to ensure that all working people have rights on the job and are able to exercise them without fear of retaliation. We should also be clear that it’s not immigration itself that creates a downward pressure on wages, but immigration restrictions and controls that make create a situation in which immigrants form a pool of cheaper labor. In a country where more than one-sixth of the workforce is foreign-born, immigrant criminalization keeps a section of workers in fear of rocking the boat, while keeping the whole working class divided and demobilized. 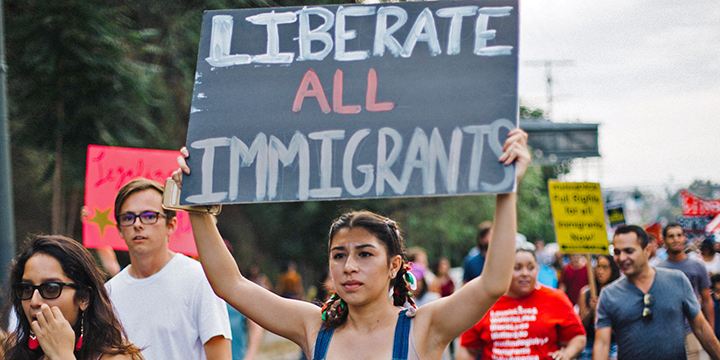 For the immigrant rights movement and the labor movement to move forward, we need to reject the CIR framework that trades massive spending on immigrant repression in exchange for continued second-class citizenship for large sections of our population. Far from being the only “realistic” defense against Republican xenophobia, CIR has weakened our side’s ability to mount a real defense, one that links arms with people of all statuses to demand that the billions being used now to police, detain and deport be used instead to provide health care, education and green infrastructure for all.